You can either call me lazy or unmotivated. Either way I have a good excuse! This week is Easter holidays, Anzac day AND it is my Birthday (on the 27th). Most importantly my birthday falls on to the week that has never happen before to me before. It has to be the shortest week ever to the weekend. So I am indulging in a Well-known Australian practice. If you are Australian we all know that Easter Monday is an excuse to drag out an event to get a public holiday. In Australia, we do not have many “country” related events thus we have less public holidays. Therefore it is every Australian’s duty to find any event and turn it in a day off, bonus points better if it is on a Monday or Friday. Yes it is a little bit sneaky but I am NOT going to argue with a day off. I have thought about other countries too. America, you have Independence day, Cinco de mayo, Thanks giving etc..
Japan, you have Coming of age day, Children’s day, White day etc..
We all know that the weekend is the best time of the week. Who is going to argue not having to wake up at all, eat chips and dips as a meal and being able to rock sweat pants with wet hair as acceptable attire? Yep this post is my blog version of sweat pants. I am taking a break this week from writing but I am still bring you a bit of sweetness. I think this cake is pushing the limits of crazy. Sometimes cakes just happen for me and this one is an idea that actually worked. 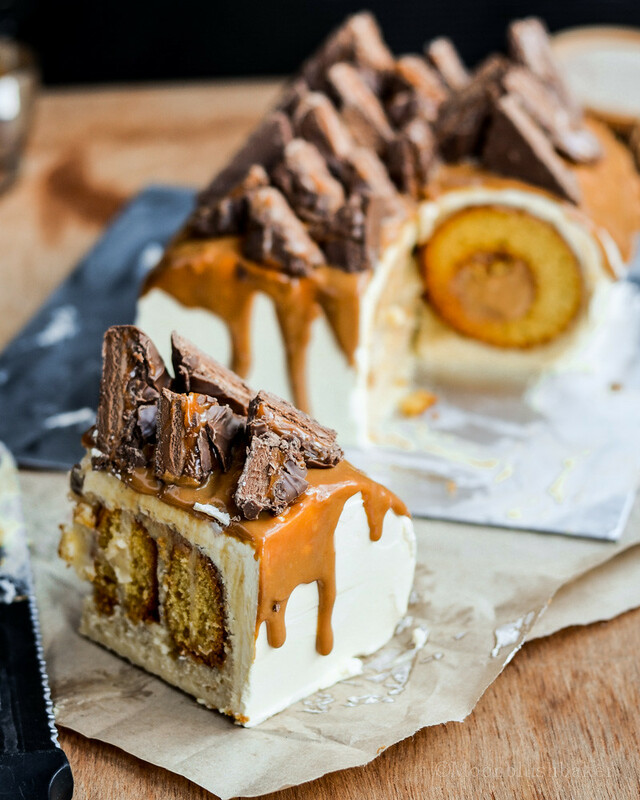 This Mars bar Tunnel cake is the only for those who love their caramel and nougat. 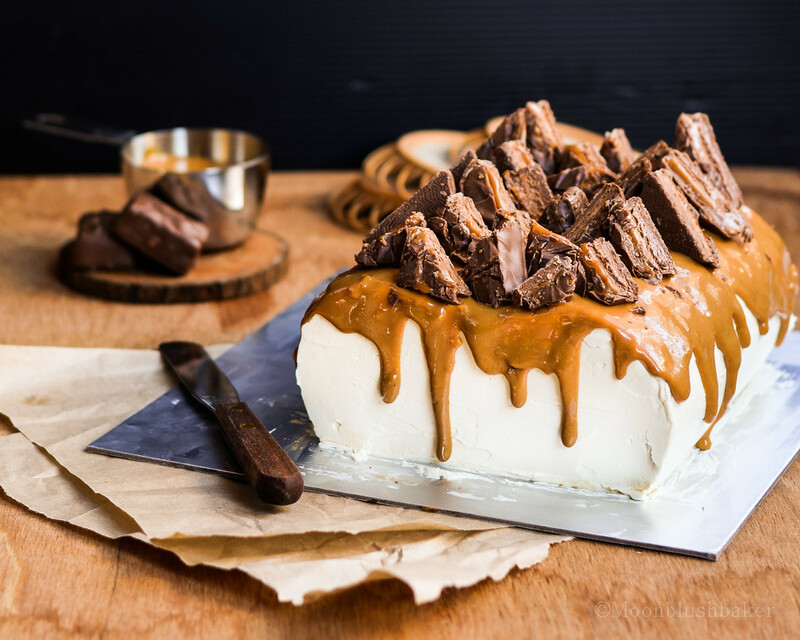 Mars bars can come under different name depending on where you live; but it is the combination of soft, creamy nougat, melty caramel and milk chocolate that has cemented itself into Australian culture. 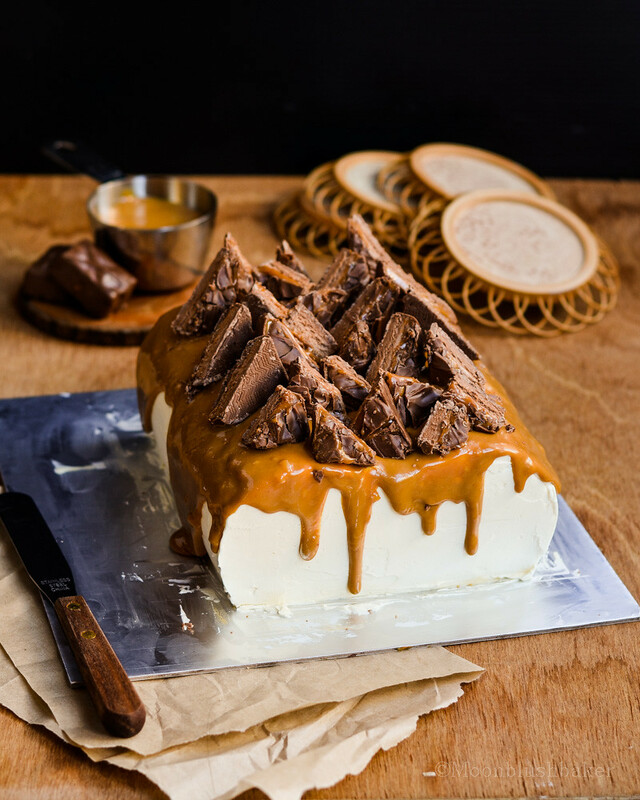 The tunnel of thick salted caramel is meant to represent the caramel in the mars bar. 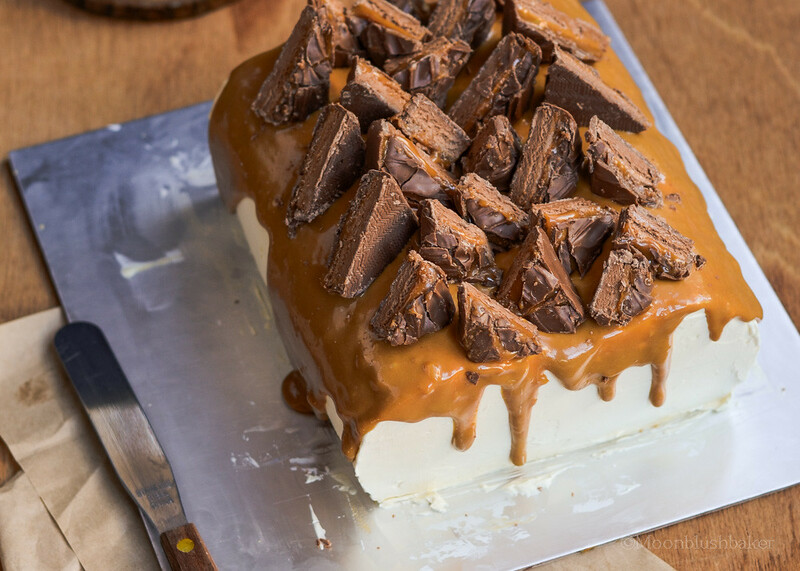 When you cut this cake the caramel oozes out like a river. Salted caramel in dangerous amount is welcome on any cake in my opinion. The dounts are made from an egg yolk based yellow cake. Egg yolks always make cake more delicious. Properties: Fragrant, buttery , soft. An inner layer of thick crème pasitierre is flavoured with nutty floral honey. More like a frosting than a custard, this creamy thick frosting melts in to a delicious honey custard. The outer layer is a Swiss vanilla butter cream. There is a reason why this butter cream is used all the time. It is simply addictive and come on! It is butter cream! 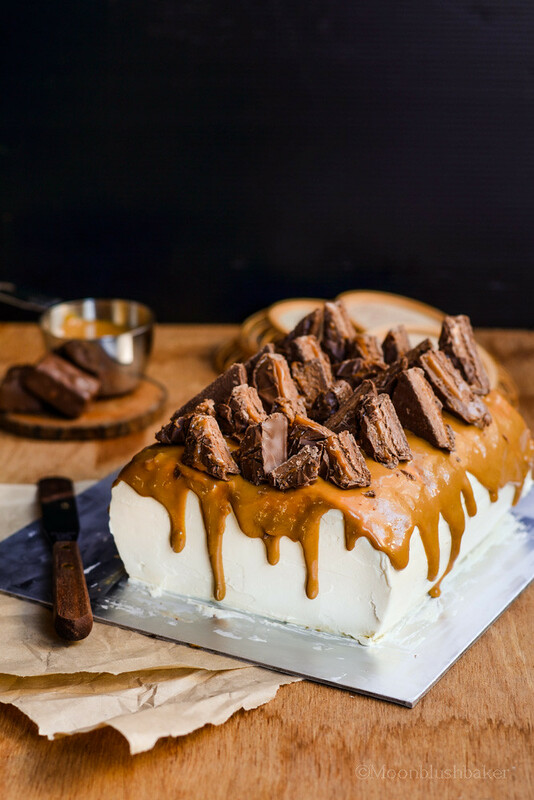 After it is covered in a thick layer of dulce de leche then topped in divided fun size mars bars. Yep the caramel topping is something that put this over the top in so many ways. 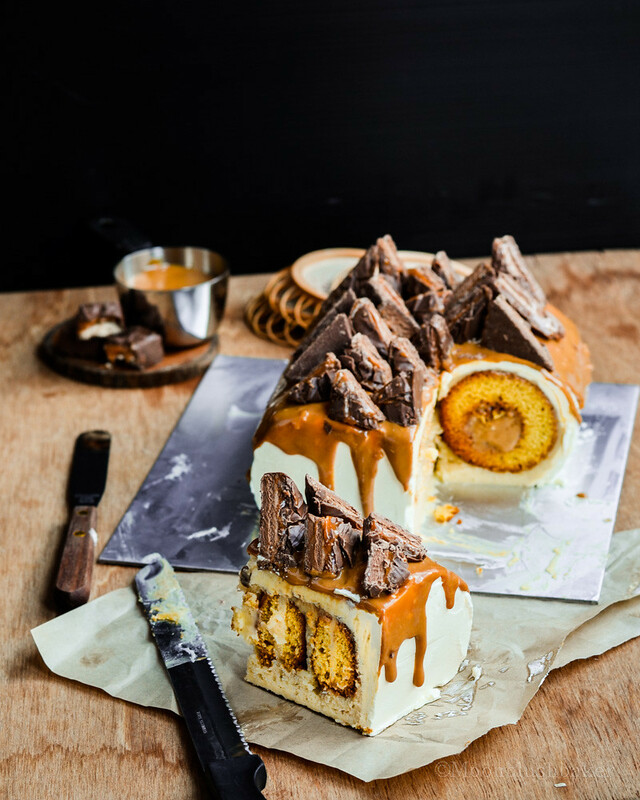 The reason why this cake has a bumpy shape is that the cake ‘layers’ are cooked in a donut pan. I am always looking for an excuse to use cake in other ways other than the main purpose; I call it being resourceful. So it essence it is an ice box cake but you can call it whatever you want. As much as I like to try and describe the feeling/taste of this cake when you slice it for the first time; my linguistic skills are not up to task. However I hope these photos can show you why this cake very well worth the mess that happen while you are assembling this cake. Preheat oven to 180C,grease your donut pan with oil or melted butter. Using ice cream scoop, fill your muffin pan half way. Sprinkle on raw sugar. Bake for 20 minutes or until a tooth pick comes clean. Bring to the boil in large sauce pan 400ml of milk and cream. Add your scrapped vanilla bean seeds and allow to fuse for 5 minutes. Pour the heated milk into the egg mixture while whisking constantly to prevent any lumps. Strain the custard back into the sauce pan. Over medium heat, stir the custard constantly wooden spoon; pay special attention to the sides and bottom of the pan to prevent burning. Bring to the boil and “cook out” the flour for 3-4 minutes. You need it to be very thick. Scrape the mixture into a bowl and cover the surface with cling film to prevent the skin forming. Fridge till needed. In a heavy base pot; bring to the boil butter, brown sugar, glucose, condense milk on medium to low heat while stirring constantly with a wooden spoon. Once boiled, remove from heat and whisk in cream. Return to the flame and boil the mixture until it reaches 118C degrees on a candy Thermometer. Remove from heat and whisk in vanilla and salt. Fridge for 2 hours until very thick and set. Fill a large pastry bag with thick salted caramel. Cut the donuts in half, length wise, so end up with 24 half donut shapes. Beat the crème patisserie with a spoon till spreadable. Prepare a cake board for the cake by spreading a layer of butter cream on the board. Using the crème patisserie, sandwich the donuts half together till you get a large cylinder. Fridge for 30 minutes. Turn the cylinder upwards so the hole is facing the roof. 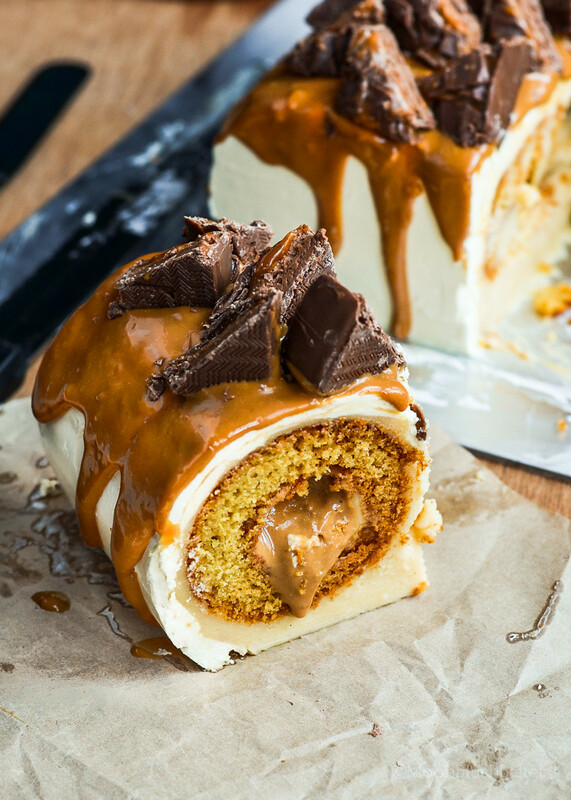 Pipe the caramel into the hole, using a chop stick or long thin spoon to push the caramel down the tube. You may also turn it around and go the other way if it became too difficult to fill. Place the cakes on the butter cream. You will get two rows from this recipe. Spread a rough thick layer of crème patisserie all over the cake, following the shape of cake. Freeze for 30 minutes. Once the crème patisserie is firm, spread the final layer of butter cream. You may do this in two steps (one crumb layer and one final nice layer). Fridge for one hour. Once ready to serve. 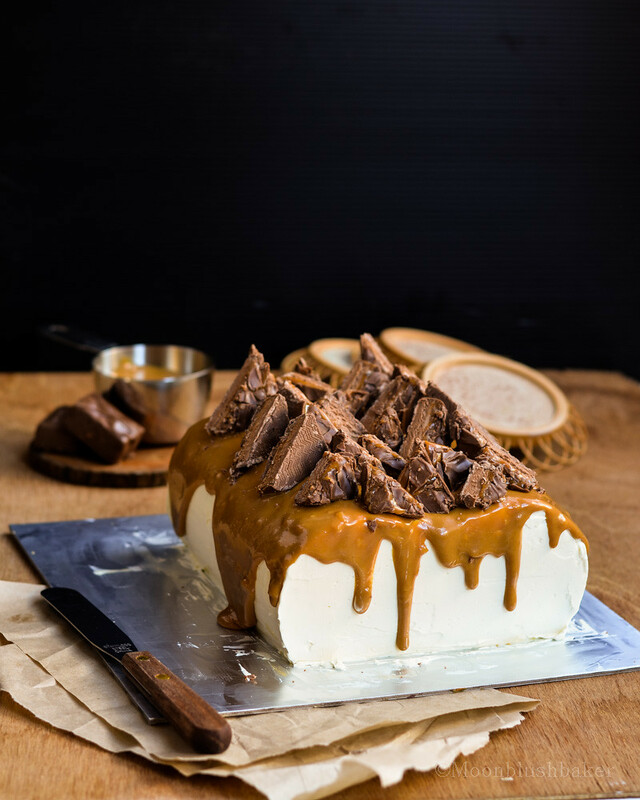 Warm your Dulce de leche for 20 seconds then pour it over the cake, gently pushing it towards the sides so it drips down the sides. It will set quite quickly. Place over your shopped mars bars. It is ready to serve but it will keep for 1 day, covered in the fridge. Is it possible to fall in love with a cake. This looks divine!! I believe it is! Thanks Love for the comment! I know right? It is broader line crazy! Thanks Salvador. I am left speechless – almost. My mouth watered. My stomach rumbled. This is such a cool cake! BTW, Happy Birthday, Sweet Girl. Mine’s next Thursday. Thanks Mad George! You are too kind to say that, Like always love the nick name! Ooooo my what indulgence! my tummy is grumbling at me. Happy birthday, I hope you have a lovely day! WOW! This is spectacular! I honestly have never seen anything like this. You’re one talented baker, Belinda! 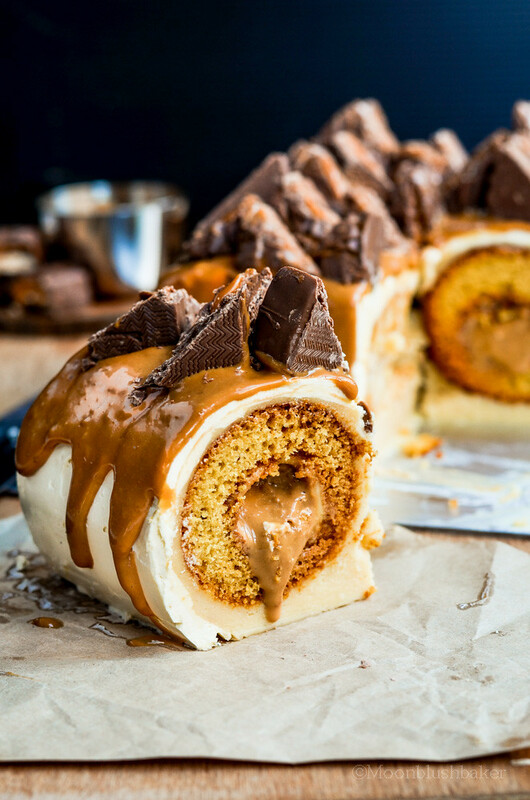 I don’t know if I can make this even after I practice baking for years…Your creations are always unique and perfection. Such a big inspiration to all of us! Oh Nami, you always have such kind words for my humble little blog. It is not as hard as you think; I am far from a perfect baker! Ithink I found what my next birthday cake is going to be. Yes make it Rob! You will not regret it! Unfortunately this recipe requires a donuts pan as the cake would crumble if you tried to cut the cake out in donuts shapes. Sorry Joanna :(, I would not you waste cake.